Before superheroes dominated the multiplex, there were Western movies. It’s estimated that more than 1,500 Westerns were filmed in the first half of the 20th century, a number that perhaps speaks to the perennial hunger to see good rewarded and evil punished through the stories of cowboys and outlaws. Because the Old West continues to inspire new stories, shows, songs, games, dances and even whole genres of music, a Western-themed party can incorporate most or all of these elements to give guests a night of entertainment. 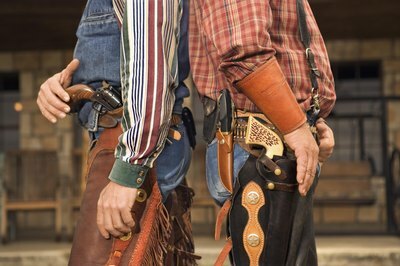 Throw a cowboy costume contest and award prizes to the guests who wear the best or most creative costumes. Create your own pants fringes using items you already have, including felt and twine, to accompany your blue jeans or miniskirt. Purchase bandannas, hats, boots and large-buckled vests and belts. Remind guests to keep the costumes generically “Western”-themed. Set the mood with traditional country-western music from the likes of Waylon Jennings, Johnny Cash, Hank Williams and Willie Nelson. The cowboy ballads of Marty Robbins are classics of the genre. For a more swinging, modern feel, play the music of Garth Brooks or Brooks & Dunn. “Boot Scootin’ Boogie,” by the latter group, is a danceable country-pop song celebrating the joys of line dancing. 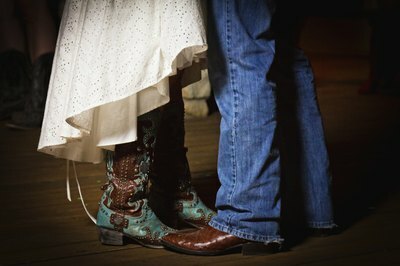 Grab a partner for the Texas Two-Step, stepping forward with your left foot, then your right, then your left and finally your right again, before twirling (or being twirled) by your partner. 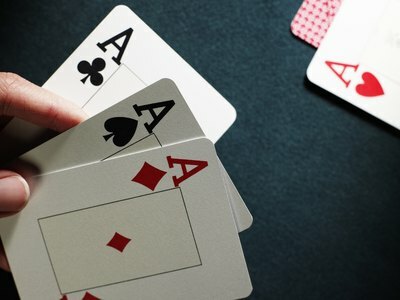 In addition to playing better-known Western-themed card games like poker and Texas Hold ‘Em, introduce guests to Faro, the simplest, and at one point the most popular, card game in the West. Featured in the movies "Tombstone" and "Wyatt Earp," Faro courted controversy because it was notoriously susceptible to cheating and sometimes ended in shootouts. Or they can play “Bang!”, a Mafia-style game in which a couple of people designated “outlaws” try to bring down a “sheriff” with the assistance of undisclosed deputies. Players guess at which players are playing which characters and attempt to destroy each other with cards signifying dynamite, guns and imprisonment. Allow your guests to "pan" for "gold" by finding stones and spray-painting them. Then hide the stones inside a sandbox and provide each participant with a pie tray for sifting. Label certain stones with a number and provide prizes for those who find those stones. Candy can also be used instead of rocks. Finally, take turns practicing your lassoing schools by attempting to rope a toy horse, and award prizes to the guests who are successful. Charleston Community Unit School District: Bang!